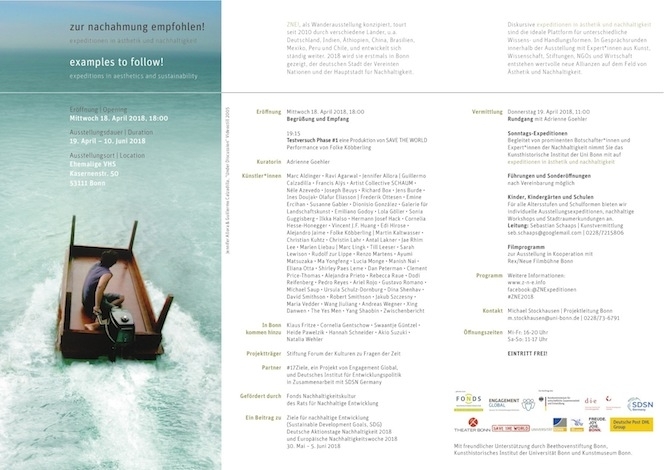 17th venue of "expeditions in aesthetics and sustainability"
They will also participate in the dialogue program organised by Engagement Global and the German Development Institute in cooperation with SDSN Germany. We are honoured that etf! can also enjoy the support of the "Kunstmuseum Bonn”. For the very first time in our seven years’ journey, examples to follow! is almost entirely financed by institutions in the field of global sustainable development. We are thankful for the support by Fonds Nachhaltigkeitskultur Rat Nachhaltige Entwicklung and #17Ziele, a project by Engagement Global on behalf of the Federal Ministry for Economic Cooperation and Development. And to the City of Bonn, Theater | Save the World and Kunstmuseum. And for Deutsche Post DHL Group for the transport.